THOUSAND OAKS, Calif., Aug. 24, 2017 /PRNewswire/ -- The Amgen Foundation today announced it will expand the Amgen Biotech Experience (ABE) to reach nearly 900,000 high school students by 2020. For nearly 30 years, ABE has empowered high school science teachers to implement real-world biotechnology labs in their classrooms to help their students better understand science and how it influences their daily lives. The three-week in-class lab initiative provides teachers with professional development, teaching materials and research-grade equipment to immerse students in the concepts and techniques scientists use to discover and develop medicines. "For many years, we have observed how the Amgen Biotech Experience brings science to life for students and teachers. We're excited to build on the program's proven success and bring hands-on science education to even more students, educators and communities," said Sean E. Harper, M.D., executive vice president of Research and Development at Amgen. "Inspiring scientific curiosity in students is key to strengthening the science talent pipeline." 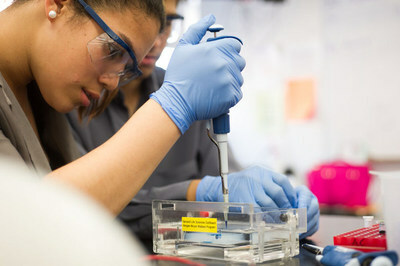 "Frankly, we're not surprised to see gains in learning and interest levels in biotechnology as a result of ABE because we have witnessed the increased excitement, confidence and enjoyment in the classroom," said David Offensend, president and CEO of Education Development Center, which manages the ABE program for the Amgen Foundation. "This program gets students excited about science and helps them imagine themselves in future roles tackling complex diseases and improving human health. We're excited that our partners will now reach even more young people." The ABE program will launch in nine new markets: Australia, Canada, China, France, Germany, Hong Kong SAR, Italy, Netherlands and Singapore. The program will continue in key markets in the United States, Puerto Rico, United Kingdom and Ireland, where Amgen has longstanding partnerships with distinguished research institutions and leading education nonprofits. This expansion brings the program's total reach to 18 markets. "Through ABE, my students get to experience the joy of discovery first-hand," said Wendy Wooten, biology teacher at Reseda High School and longtime ABE participant. "They transform living cells into protein factories, and see whether or not they succeeded in the endeavor. They get to be real life scientists." Learn more about ABE by visiting AmgenBiotechExperience.com. To learn more about the Amgen Foundation's other science education programs, visit AmgenInspires.com.